Frequently portrayed in the media, “Immigration Reform”, “Dreamers” and “DACA” can often seem like rather remote concepts, especially for those that follow the news from Washington. For over a decade, Congress has been perpetuating loop of partisan stalling tactics, party line bickering and a series of flat out refusals to address the issues. We’re to the point now where some Democrats in the United States Senate consider it a win to even “hold a debate” on the issue. But for cities like Houston, the consequences of the Federal Government’s horseplay are creating earthquakes across large segments of our community. The fear of deportation is inescapable, and the consequences of when loved ones are ripped from their communities do not end with the next day’s news cycle. On Tuesday, January 30th, after he was repeatedly bullied by his classmates, he decided to defend himself. Things escalated and he found himself in an altercation with one of the bullies. Instead of de-escalating the situation, and guiding Dennis and his classmate in reconciliation, HISD’s troubling protocol allowed HISD Police Department to arrest Dennis on charges of assault, which the District Attorney immediately filed against him. Within hours he was transferred to Harris County Jail where an ICE hold was placed on him for being undocumented. Students go to school for education, and they should feel safe while they’re there. They shouldn’t have to fear that they’ll be disciplined by police – or worse end up in detention or deported. Dennis was eligible for, and paid, a $2,000 bond, but instead of being released to his family, the Sheriff’s Department handed him over to ICE. This is because the Sheriff’s Department has a policy to work closely with ICE by sharing information, allowing them to interrogate individuals in the jail, and to pick them up before they leave the jail. Because Dennis was not given any information about his rights, the information he shared about himself alerted ICE of his presence at the jail. This ongoing collaboration between the Sheriff’s Department and ICE is just a way to increase mass deportations locally. A high school Senior at Austin High School, Dennis was accepted to both Texas A&M Corpus Christi and Lamar University, and plans to study computer science. If deported, Dennis will be sent back to Honduras, a place of extreme violence and insecurity. And he will not be able to graduate in May or attend college in the Fall of 2019. The outrageous reality is that too many systems have failed Dennis and many other immigrant youth. HISD failed Dennis by letting police officers decide that incarceration is the solution to bullying. The District Attorney’s office failed Dennis by using their discretion to charge and prosecute Dennis, and to file a second case against him for forfeiting his bond, which was of no fault of his own because he went into ICE custody. The Sheriff’s Department failed Dennis by obtaining information from him that was shared with ICE and then allowed ICE to arrest him from the jail. So today during their lunch period, the students of Austin High School decided to take a public stance in solidarity with one of their own. 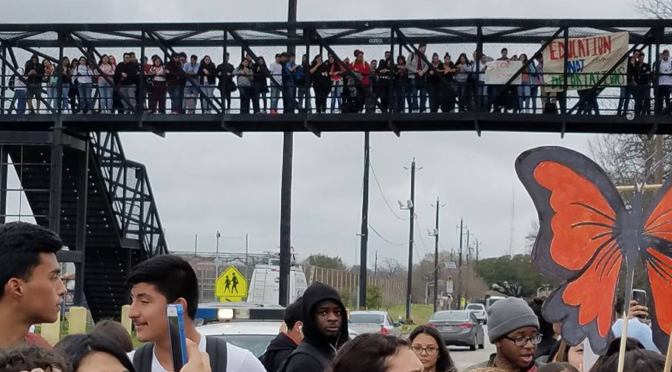 Video from KPRC Local 2 News Reporter Rose-Ann Aragon captures the protest, as students overtake the street adjacent to their school. Lest we forget, this is Houston, under the jurisdiction of Harris County Sheriff Ed Gonzalez, who allegedly ended automatic cooperation with the ICE officials (a program known as 287(g)) within months of assuming office in 2017. If you recall, ending the program was a central tenet of Sheriff Gonzalez’s campaign platform, due in part to the fact that Harris County jails are already too overcrowded that they should not be housing non-violent offenders. Umm, Sheriff… is that practice over? After all the talk about ending 287(g), is it still in effect?? The story is still developing, but one thing is for sure. The Immigration “debate” is anything but remote for Houstonians.